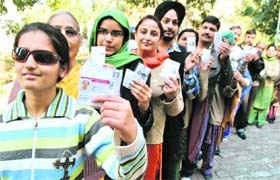 The electorate in Punjab came out to vote overwhelmingly for the 117-seat Assembly elections today with 76.63 per cent (preliminary estimate) of the 1.76 crore voters exercising their franchise. 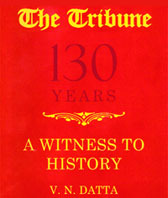 This is the highest figure since the state was reorganized in 1966, Election Commission sources said. 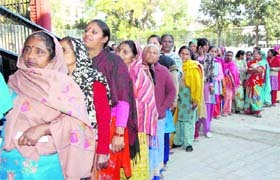 Polling in 70 Assembly constituencies in Uttarakhand today ended on a peaceful note with more than 70 per cent of voting recorded in the state, a jump of around 6 per cent since the 2007 Assembly polls when the polling percentage was recorded at 63.77. Women voters outside a polling booth in Dehradun on Monday. Women�s groups are up in arms against the award of President�s Police Medal to the officer who allegedly supervised the sexual torture on Soni Sori, an adivasi teacher currently under trial in Chhattisgarh for alleged links with Maoists. The CBI today arrested senior IAS officer and Andhra Pradesh Principal Home Secretary BP Acharya in a corruption case involving a real estate project under public-private partnership with a Dubai-based company. 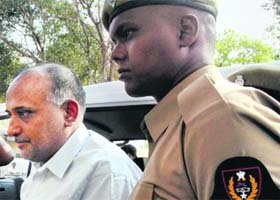 Emaar MGF South India Finance Head G Vijay Raghavan being taken to Chanchalguda Jail in Hyderabad. The Scottish surgeon who was appointed as guardian to Maharaja Dalip Singh was not above trying to feather his own nest at the Maharaja�s expense. Newly released documents show that Dr John Login tried and failed to persuade the East India Company to give him a �1,000 annuity from the personal privy purse of the deposed Maharaja.